Making connections. That’s what Monica Gallant was happy to see happen between families and organizations that help keep youths healthy, safe, and alcohol- and drug-free during a recent event. The Red Ribbon Week Community Celebration, held Saturday, Oct. 29, featured games and prizes, costumes, an opportunity for kids to sit in a fire truck and more. Just as importantly, the event was an opportunity for Community Action for Safe Teens, which organized it, to showcase local agencies and groups that help carry out its mission of keeping youths safe and assisting them in making healthy lifestyle choices. "There were some connections made – that’s what it’s all about," Gallant, CAST’s coordinator, said as the free, three-hour outdoor event came to a close. The celebration was held in conjunction with Red Ribbon Week, a national drug, alcohol and tobacco prevention awareness campaign that’s observed annually in October. This year’s theme was "YOLO (You Only Live Once). Be Drug Free." Organizations that participated in the celebration at the Boys & Girls Club of Souhegan Valley, included churches, recovery organizations, 4-H, a support group for single parents, and the local fire department and ambulance service. The Milford High School football team ran an obstacle course, and nearby, Milford Police K-9 officer Mike Barritt introduced Barry, a 4-year old Dutch shepherd, the department’s new canine, to kids and adults. At several booths, parents could pick up information about CAST, parenting tips for healthy child development, mental illness, health care, addiction and the work of local groups that can have a positive impact on people’s lives. Families also toured the club’s new teen center. "We want (families) to learn more about what’s available in the community," Gallant said. CAST, a committee of the Boys & Girls Club founded in 2004, serves Amherst, Brookline, Hollis, Lyndeborough, Mason, Milford, Mont Vernon and Wilton. The organization carries out its mission through a variety of programs and activities, including teen leadership training, teen workshops on making public service announcements promoting healthy choices, and community workshops and forums. One of its goals is to create a culture of healthy choice-making in schools. Gallant believes their efforts have paid off, citing data from Youth Risk Behavior Surveys, conducted by the federal Centers for Disease Control and Prevention, which show an overall decrease in substance use from 2013-15 by local teens. Andrew Taylor, a Scout leader of Cub Scout Pack 421, was one of several people representing an organization that came to interact with the public. He invited kids to play a memory game. He had them look at an assortment of items related to Scouting, including a lantern, compass, pocket knife and flashlight, covered the items with a tarp and asked them to recall what they saw. All participants, no matter how well they did, were rewarded with a lollipop. "I’m here to recruit and get the word out about Scouts," Taylor said as he stood by a display of photos of camps, outdoor meetings, archery and other fun activities. "We’re trying to showcase some of the activities we do throughout the year." At another booth, kids tossed bean bags through holes in one of two large pumpkin character boards. "They love to play, especially the little guys," said Susan Drew, of Milford United Methodist Church, who handed out spider-looking rings as prizes. "It’s something they can do." 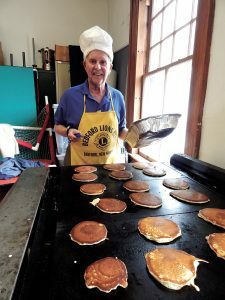 As Drew greeted families, her husband, Kevin, along with other members of the Milford Lions Club, provided hungry kids and adults with hot dogs, burgers, popcorn and drinks. Kevin Drew said the club would donate the donations it received to CAST. Like several others at the event, both Drews wore red ribbons featuring the message "We’ve Got Better Things To Do Than Drugs." Kym Haig, of Wilton, came with her family, including her five grandchildren. She said they enjoyed a close-up look at the fire truck and ambulance, played the bean bag toss and other games, and met several members of the River of Life Church in Amherst dressed as pirates and an elf. Her grandkids were among the many youngsters who each received a plastic fire helmet from firefighters when families stopped by to see the fire truck. "We show them all the tools we use and the gear we put on," Lt. Gary Williams said. Ray McDaid represented two organizations at the event. He’s the associate pastor at Household of Faith in Amherst, which has a recovery ministry focused on alcoholism and runs meetings that support people struggling with substance abuse and affected loved ones. He’s also the director of programs at Addiction Recovery Coalition, which partners with businesses and community organizations to develop solutions for people struggling with addictive behaviors. "This is a big problem, and it causes devastating consequences on families, children, adults and everyone involved," McDaid said. "We believe this makes a difference." One of the visitors to McDaid’s booth was Charissa Eno, who was representing Bethany Christian Services. In addition to spending time at her own booth to provide information about the organizations’ programs, including adoption support and providing for the needs of kids in foster care, Eno visited other booths and spoke with the representatives working at them. "It’s good for me to know about the resources in the community," she said.